Time | A Mirror of My Thoughts! A disclaimer here: I am encouraging the usage of Ebooks indeed, though I would prefer the silent rapture of being immersed in a physical book any day. Yet, if we look at the availability and access to these modern classics, most of these are rare treasures that are hard to come my way over a breezy shopping fest. And I don’t believe that these 100 Novels are the best of the literature ever produced, for some of my most cherished books like Life Of Pi, Alchemist, Kite Runner, The Stranger, Fountain Head, Alice In Wonderland are still treasured even if they are not hailed in any literary short lists. However, I still see this as an opportunity to discover new worlds that are ensconced in these books. I came across this link yesterday. Its a list published of all time top 100 Novels published since 1923 by TIME Magazine in 2005. Apparently, it took me 3 years to discover it. A quick glance through the list highlighted 15 titles that I am familiar with and also introduced me to a world of 85 books and authors whom I never heard of. Going by the experience of those 15 which I loved, my expectations on the rest 85 are really sky high. For those Ebook lovers, these Websites offer most of the books in list for free download. It was just yesterday when the entire dinner table conversation was hogged by sun signs. 🙂 I have always been agnostic to the power of what stars have conspired over in sky, as I do believe that I hold my destiny in my arms. 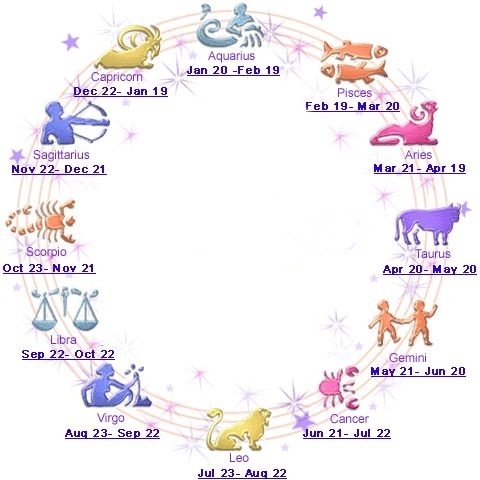 Yet, its always intriguing to learn what each sun sign has to say even if its just to whet my curiosity, as long as it spells a few good things of my pals which I accede to or differ with. Yes. I love Linda Goodmans and must have read those descriptions a number of times, for I loved the way she expressed the idiosyncrasies of those sun signs. I really wouldn’t care the veracity of her claims as its a fun read! Those who has read her book would know what I mean. Matching the traits of the Sun signs with our own, taking the opinions of others, musing through the compatibilities really makes us create that connect or belongingness. As long as we don’t hold fast and take to heart what those sun signs spell and reserve them for a great and light coffee time conversations, I guess we can assure ourselves of some cheer and fun! Thought For The Extended Weekend..
“Most of us spend many hours each week watching celebrated athletes playing in enormous stadiums. Instead of making music, we listen to platinum records cut by millionaire musicians. Instead of making art, we go to admire paintings that brought in the highest bids at the latest auction. We do not run risks acting on our beliefs, but occupy hours each day watching actors who pretend to have adventures, engaged in mock-meaningful action. Here is another forward that I have received a long time back. There is no specific reason to post this apart from the fact that I liked this.  This story brings out quite creatively that time is much needed to appreciate the richness of love.. Muse on..
Once upon a time, there was an island where all the feelings lived: Happiness, Sadness, Knowledge, and all of the others, including Love. One day it was announced to the feelings that the island would sink, so all repaired their boats and left. Love wanted to persevere until the last possible moment. When the island was almost sinking, Love decided to ask for help. Happiness passed by Love too, but she was so happy that she did not even hear when Love called her! Suddenly, there was a voice, “Come Love, I will take you.” It was an elder. Love realizing how much he owed the elder and asked Knowledge, another elder, “Who helped me?” “It was Time,” Knowledge answered.